Aside from your day-to-day business goals, have you ever considered learning about the benefits of managed print services, and how these services can help further the success of your company? You might be a little unfamiliar with managed print services and the specific ways managed printing can help your business grow. If this is the case, you’re in luck, and you’ve come to the right place! Let’s start from scratch and first define what managed print services are. Managed print services (also known as MPS) are outsourcing services to help manage your print fleets, such as printers, copiers, and fax machines. Investing in managed print services is a further step you can take once you’ve successfully partnered with a business technology company. So, now that you have a better understanding of what a managed print services company can do for your business, we can begin exploring the most significant and valued benefits for your business. 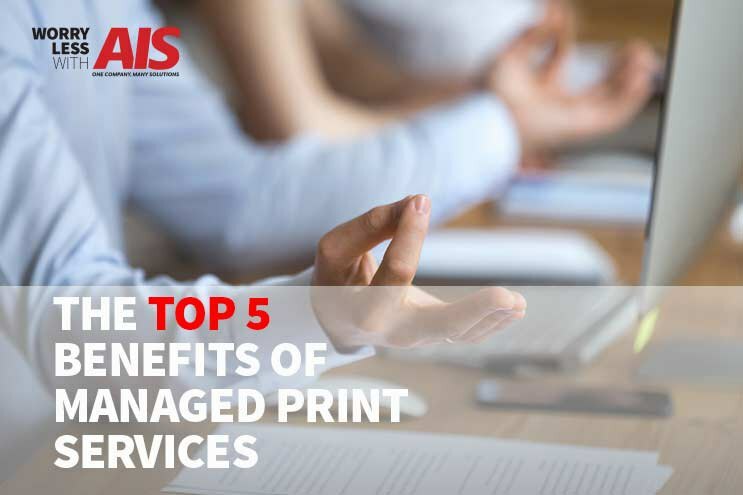 Read along as we go through the top five benefits of managed print services and how these services can grow your business. If you feel you still need more clarification on these services, read our article, What is Managed Print Services? We get that your business is busy, and you might not have the hours in the day to strategize about strategy and print management. However, not having a print strategy is risky, and can cost your business a lot of money. Follow along as we go over the top 5 benefits of partnering with a managed print services company. Managed print services focus on identifying and solving any of your current printing issues that may set your company and projects back. By designing a solid plan, an MPS program can reduce labor and optimize workflow resulting in lower costs. An MPS provider may even discover potential or current issues you’re unaware of. The goal of a managed print services company is to provide you with advanced print solutions so that your business technology and operations can perform at it’s best each day. With the right managed print services team, all of your printing processes are analyzed and interpreted so that adjustments, large and small, can be made to improve efficiencies. The more a managed print services company learns about your current technology, the better strategies they can set in place to continue the success of your business and employees. Let’s face it, your IT department is probably overworked and continually being pulled in different directions daily, as each department needs the assistance of an IT team. With a managed print services team, your IT department can go back to focusing on their everyday tasks, as well as becoming more available and accessible to your employees. IT departments really can't afford to be troubleshooting printing issues or equipment breakdowns. They have more pressing projects and issues that they need to be focusing on. In today’s day in age, maintaining a safe and secure network for your business is one of the most important things you can invest in. Even if you think your office equipment is safe from online hackers, you might be wrong. There are always things you can do to improve the security infrastructure of your office. A print assessment can identify print and IP security risks your organization is currently facing or can face in the future. A great MPS provider helps alleviate those risks with a tailored print security plan. Also, having just one print provider implementing your managed printing reduces the number of outside users having access to your networked devices. It’s helpful to remember that not all MPS providers are the same when it comes to their ability to combat information security threats. Information security requires ongoing audits, system improvements, and the implementation of new software and hardware. Learn even more on security through managed print by reading an article published by The Cincinnati Business Courier, 5 Ways Managed Print Services Can Boost Print Security. Everyone loves ways to save money at their business, and it’s important to know how much money you could be saving by investing in a managed print services team. Are your employees printing on a nearby printer that carries a high cost per page, instead of sending the job to a multifunction printer that has a much lower cost per page, but requires walking an extra 10 seconds? Are all users printing in color whenever they want to? Which departments are using the most toner or color ink? Does it seem like you’re constantly purchasing supplies? When’s the last time you monitored all of the printing by staff in each department or the overall printing needs by your entire company? These are just a few areas where you can drastically cut the costs of printing by learning which employees or departments are spending the most money. An MPS provider will walk with you down the path of lowering total cost of ownership for your document imaging technologies, as well as providing you better cost-effective strategies. Besides costs savings, accurate and anticipated budgeting is another great feature of managed print services. In an unmanaged print environment, print costs are a dim part of overall IT costs. This leads to a situation where no one is really aware of the full extent of printer-specific costs. Managed print services help to categorize print costs more efficiently, in a more organized way. The ability to track printer usage on a per-user basis makes it easy to create an accurate budget that truly reflects what your organization spends on printer resources. Partnering with a managed print services provider helps keep costs down while increasing productivity and increasing efficiency. In relation to your office printing, you’ll begin to see returns in annual profits. If you want to learn even more ways managed print services can help your business, read our article, How Managed Print Services Can Help Manage Print Costs. At AIS, we believe our clients should be fully aware of the associated costs of their office technology, especially when it comes to business copying, printing, document management, and workflow. If you want more visibility or think your printing costs are beginning to get out of control, contact one of our business technology consultants, here. Don’t forget to check out our YouTube channel, The Copier Channel, to learn even more on office technology and your business. We’re here to give you peace of mind to help you win more business.